The Spektrum™ AR9130T PowerSafe receivers is a feature-packed 9 channel receiver with integrated full-range telemetry. Each come with built-in connection ports for RPM, Flight Pack Voltage and Temperature sensors as well as an X-Bus port for additional telemetry options. If you have a DSMX®/DSM2® transmitter capable of 11ms frame rates, the AR9130T will deliver lightning-fast input-to-output response that is perfect for high-performance applications such as aggressive 3D , IMAC, and Turbine Airplanes. 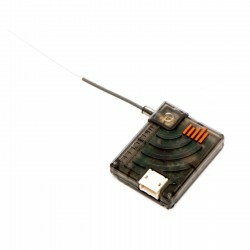 Each receiver includes 2 remote receivers that take advantage of Spektrum MultiLink™ technology. This patented technology eliminates the reflected signal fading and antenna blind spots that can affect all 2.4GHz systems. A ground-breaking feature introduced on the AR9130T PowerSafe Receiver is the built in receiver battery energy sensors. Giving pilots added awareness of the load and mAh used by the servos, retracts, lights, etc. used by each battery. Current Gen 2 Radio firmware already supports this function. 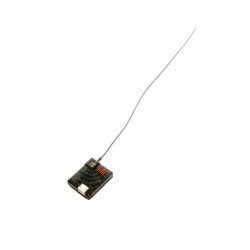 Also, as with most of the current receiver line up, these feature a bind button that gives pilots an easy alternative to the age old bind plug.